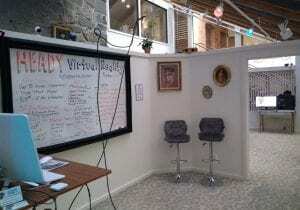 Heady Virtual Reality is open seven days a week and located in the Bellingham Hardware Building. Its entrance faces Bay Street. Photo credit: Matt Benoit. There’s a place in downtown Bellingham that can transport you to a whole new world. It’s an immersive environment of sight and sound that makes anything possible, from flying through clouds to killing zombies. 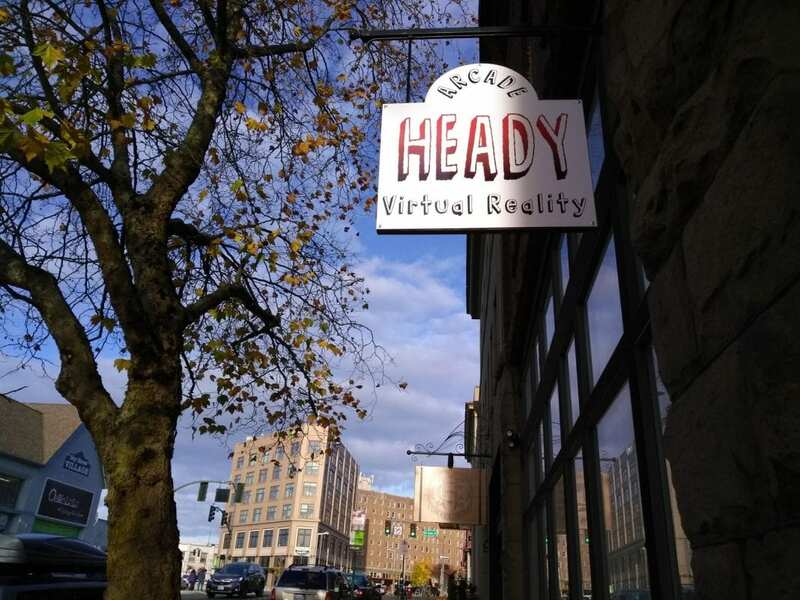 That place is Heady Virtual Reality, Bellingham’s first and only virtual reality arcade. Since opening in August, Heady has been attracting a growing stream of customers eager to experience the growing trend of virtual reality, also known as VR, gaming and simulations. The arcade is the brainchild of Zach Brown, a Tumwater, Washington native who moved here from Portland in 2016. Customers try out VR games at Heady Virtual Reality. The arcade has over 90 titles to choose from. Photo credit: Matt Benoit. 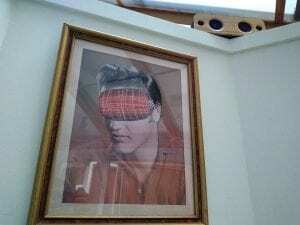 Inside a cozy, carpeted suite at 215 West Holly Street, the walls are decorated with various framed historical portraits, all altered with VR goggles placed over subjects’ eyes. On a wall near the entrance, the company’s first dollar is tacked next to a business license. George Washington, too, is wearing VR goggles. Even Elvis loves virtual reality. Photo credit: Matt Benoit. Brown graduated from the Art Institute of Seattle with a digital filmmaking degree. His first gig out of college was working in the art department for the first Twilight movie. Two years ago, Brown saw – or rather experienced – his first virtual reality movie. It was a short film – a horror flick, actually – that put him directly into the story, experiencing the ending plot twist first-hand. Today, more and more directors – even big names like Darren Aronofsky – are putting together VR studios to create immersive, mind-bending content. The three VR stations are comprised of a custom-built PC and VR software, a set of VR goggles, and handheld controls for each user. Photo credit: Matt Benoit. Still, Brown’s idea to start his own VR arcade didn’t occur until early this summer. He was between freelance gigs and had recently lost an art studio space on State Street due to development. Brown was ready for something new, and wanting to do work that would engage him with community members. He wanted to host something that would make people feel welcome. Recalling his earlier movie experience, he began research and decided ‘that something’ was virtual reality. Brown says he’s honored to bring Bellingham its first VR arcade, and wants to expose and educate people about the wonders of the technology. The cozy and carpeted suite features three VR stations and a mini-fridge stocked with refreshments. Photo credit: Matt Benoit. Heady is equipped with three VR stations featuring a custom-built PC, VR goggles and accompanying handheld controls. Each unit costs about $3,000 before software is added, and Heady has a lot of software: there are more than 90 VR titles, from first-person zombie shooters (especially popular these days, Brown says) to a simulation putting you in a cubicle-filled office. There are racing games, a VR-version of Google Earth, and a traffic cop simulator, among other things. Basically, there’s something for everyone. Brown especially likes ‘Tilt Brush,’ a painting simulator that would, he notes, make Bob Ross proud. He hopes to host a virtual painting contest in the near future. While visiting Heady for this article, I tried out the arcade’s new graffiti simulator, and can report it was immensely fun to spray-paint the side of a train without fear of criminal charges. The simulator’s color palate and spray nozzles would give real artists a chance to do some impressive work. Also enjoyable are escape room simulations, usually in horror genre settings. Users begin chained up in attics or stuck in other locations, sometimes in the dark, and must problem-solve to find the only way out. SpringboardVR, one of the first companies to consider VR arcades, provides Heady considerable access to games and simulations. Developers of popular console games are also redesigning content to be VR-compatible; Skyrim is currently available at Heady. Brown says multiplayer VR is extremely fun, and commonly allows people of all ages a bonding experience. Recently, Brown recalls a father in his 70s and son in his 40s who came in to shoot zombies together, and had a fantastic time. Children as young as eight can try VR, and there’s content to accommodate them. Those who’re younger, or anyone with epilepsy, should pass. 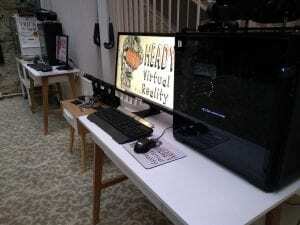 In addition to their Holly Street location, Heady has a mobile VR unit that can be brought to a home, office or event space. In-person VR sessions begin at $10 for 15 minutes, and can be purchased in-person or reserved online. Monthly memberships are also available. The arcade hosts weekly Thursday tournaments and features Happy Hour discounts Monday through Wednesday. Students and seniors receive Sunday discounts. While Brown is only aware of two other VR arcades in the Pacific Northwest – one in Portland and one in Seattle – he sees VR only expanding in usage over time. From arcades and cinemas to homes and hospitals, it has numerous potential applications for augmenting our current reality. 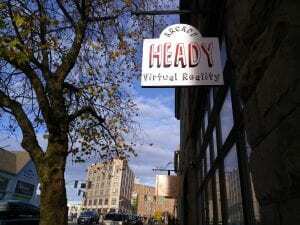 Heady Virtual Reality, open seven days a week, is located in suite B-28 at 215 West Holly Street (Bellingham Hardware Building). Its entrance faces Bay Street. For more information, visit their website or Facebook page.